My kids and I watched this together, it was a fun adventure full of life and color, making for the perfect movie watcher experience! Get ready for a south-of-the-border journey, when the animated adventure Americano arrives on DVD, Digital HD and On Demand on June 13th from Lionsgate. 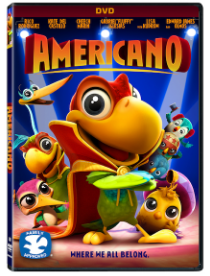 Awarded the Dove Family Seal of Approval, Americano tells the charming tale of a colorful Mexican parrot named Cuco who sets off on an adventure to defend his family. Available in both English and Spanish, the film features the voices of Rico Rodriguez, Kate Del Castillo, Cheech Marin, Gabriel “Fluffy” Iglesias, Golden Globe® nominee Lisa Kudrow (Best Supporting Actress, Television, “Friends”), and Academy Award® nominee Edward James Olmos (Best Supporting Actor, Stand and Deliver, 1988), in addition to radio personalities Don Cheto, El Mandril, and Argelia Atilano. The AmericanoDVD will be available for the suggested retail price of $14.98. Primal Kitchen A great way to make food better! Florida’s Natural Lemonades need I say more?